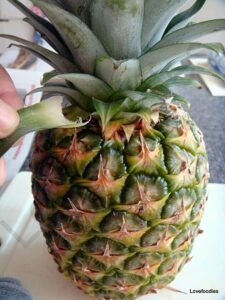 How To Prepare A Pineapple with MINIMUM Waste….yep, you won’t believe how much of that sweet flesh you throw away! Take a look! Have everything ready before you start. ***** If at any time your hands feel sticky or slippery, please use your damp cloth and dry your hands and also the handle on your knife. – Safety first! 1. See if your pineapple is ripe by getting a leaf from the bottom and giving it a sharp tug. If the leaf comes off easy then it’s ripe! 2. Lay the pineapple on its side and cut both ends off. 3. 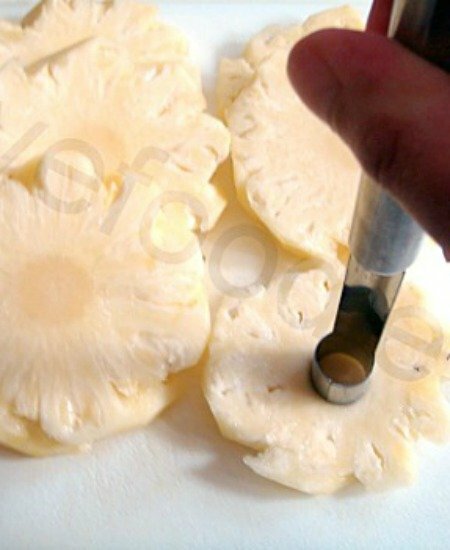 Stand the pineapple on its base and cut from the top to the bottom, following the shape of the pineapple. Cut the skin off thin. 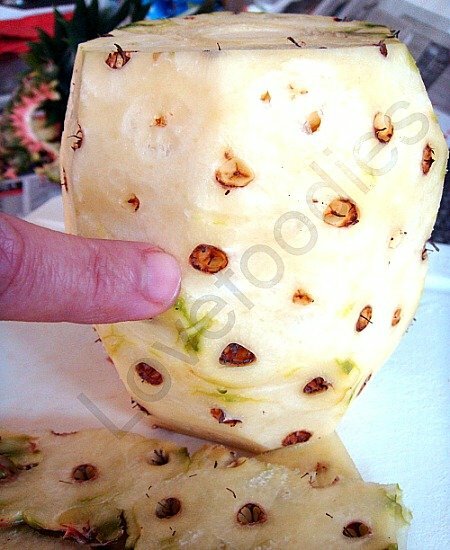 See in the bottom right of the photo how thin my pineapple skin is I cut off. 4. You see with my finger those little brown holes (eyes)? 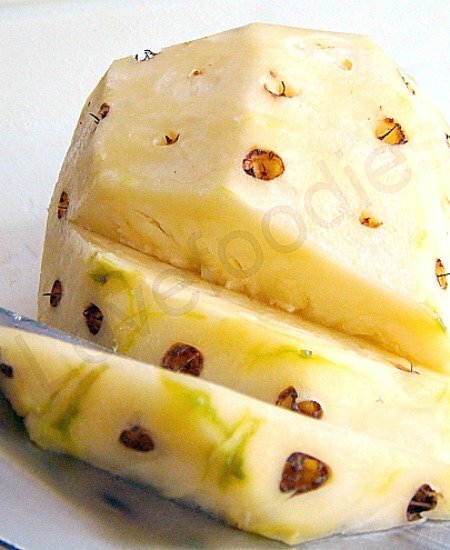 We need to get those off so turn the pineapple back on its side. 5. 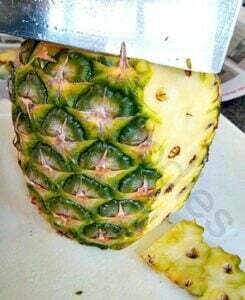 Take your sharp knife and make a cut at a 45 degrees angle so the blade is in the pineapple and pointing toward those brown eyes, and cut through a little, not too deep. 6. Then do the same on the other side of those eyes, pointing the blade edge toward the eyes. 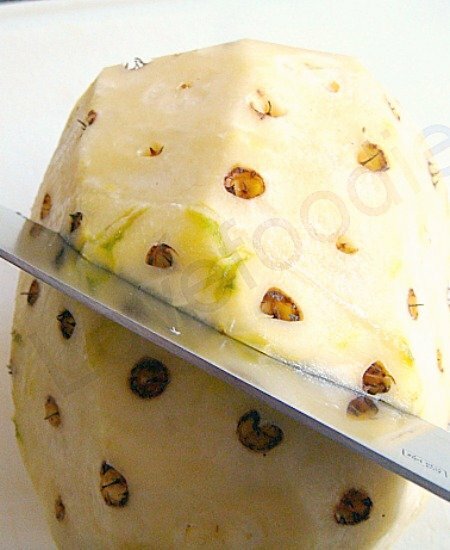 **** Keep your chopping board clean and mess free. Transfer your waste to the newspaper so it is not in the way at frequent intervals. 7. 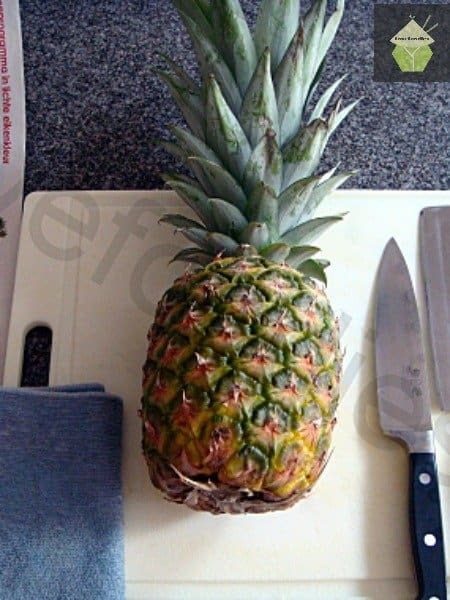 Roll the pineapple over and repeat to remove all the eyes. You can usually cut 3 -4 eyes out in one go. 8. 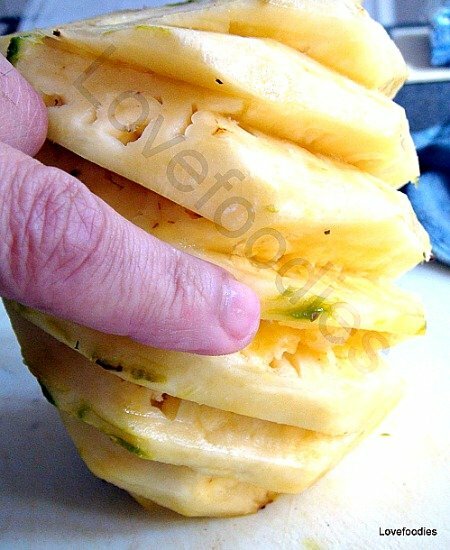 Stand the pineapple on its base again and do you see some bits you may have missed? Some green skin or some eyes. 9. Using your knife, shave off any green bits and cut out any brown eyes using the angle of the blade again like you did in steps 5 & 6. Once done, your pineapple will be ready for slicing. 10. 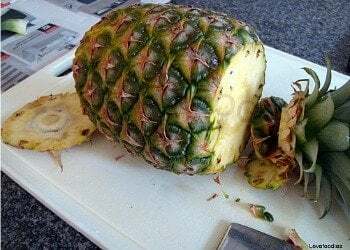 Turn the pineapple on its side once you’re happy all the brown & green bits have been removed. 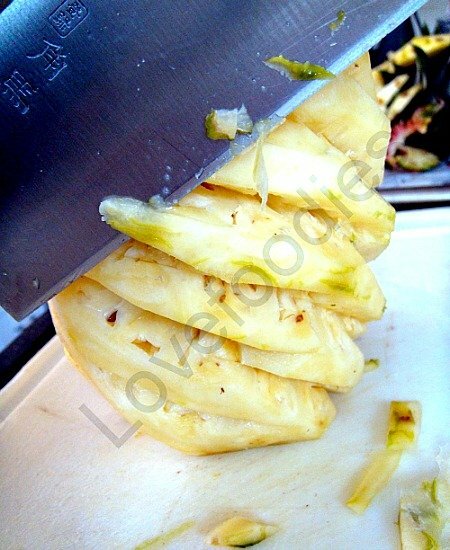 then slice straight through at thickness intervals to suit your liking. 11. If you do not want the core in the middle of each slice, take an apple corer and remove it. 12. Save the left over cores in a zippy bag for the freezer and you can add them in your cooking say if you make a Hawaiian casserole or pulse them down and add to smoothies etc! They have flavour but can be a bit hard to chew, but don’t throw those little gems away! 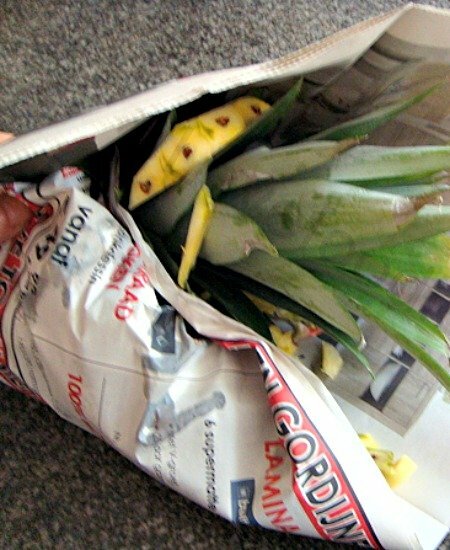 Wrap up the pineapple waste in the newspaper and compost it or dispose accordingly. 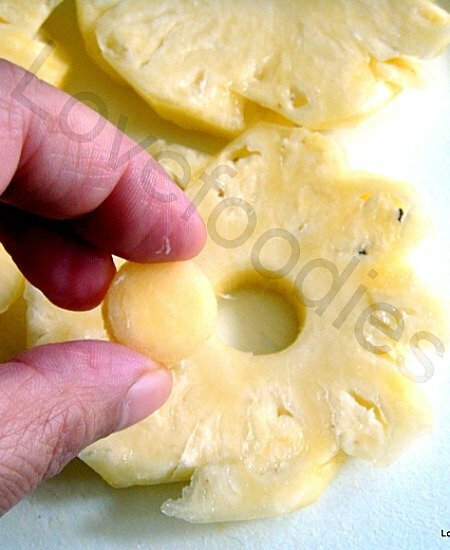 Your pineapple slices will keep in the fridge for a couple of days, or in the freezer in a zippy bag and you can get some out when needed. We’d love to hear from you and what you thought of our post. Did you make any changes? Let us know in the comments below. Thanks for reading and happy cooking! I made this cake, and it was a pretty thing to look at. However, it was too dry – fine the first day and very dry the next. Hi Patti, I’m not sure which cake you made because your comment is under a different recipe, but if saving a cake for the next day, always try to cover it well with plastic wrap and put in an air right container. As they’re fresh cakes with no additives nor preservatives, they don’t last as long. Also, if you wanted to ‘un dry’ a cake, you can pop a slice in the microwave for about 15 seconds and that usually does the trick! Great tutorial! 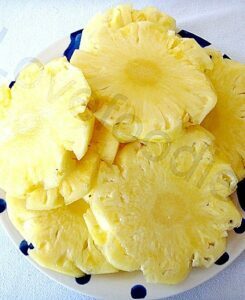 Love serving pineapple around this time of year! Thanks for your feedback Patricia! Great tutorial – I learn something every day!! 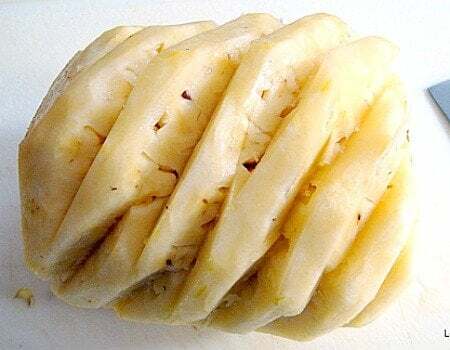 What a neat trick and it makes your pineapple look fancy too, LOL. I use the end of an old potato peeler to cut the eyes with less waste than your knife cuts. Otherwise all the instructions are right on. Great idea! 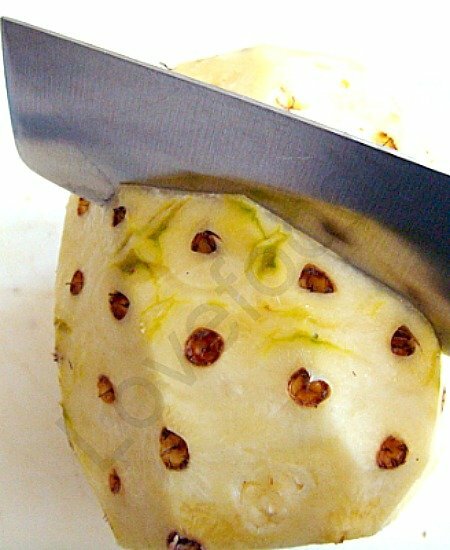 It will take a little longer to do that but will certainly save even more pineapple! well, i’ve known this style since the day I was introduced to pineapple like 30years? There’s even utensil especially for those pineapple eyes. Still a very good help for those who are not aware yet.